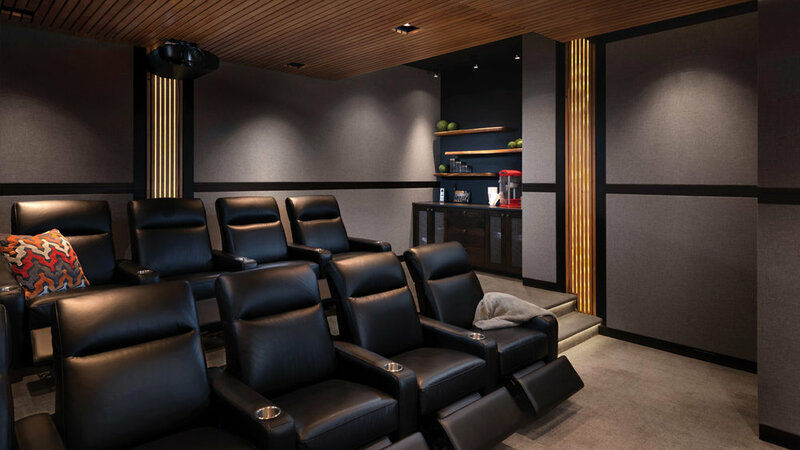 Though we can’t deny that we love to design and build home theaters for our clients, not every home has the space, or the client is seeking something a little more creative to be done with their space. Instead of tucking away a home theater in the basement that only gets used on the weekend, where the family can indulge in the latest blockbuster film, we’re finding that a lot more people are seeking rooms that are multi-functional. Rooms that can be used for more than just watching the latest movie. Something has to be said though for having a home theater… a room devoted solely to curling up in the darkness, a larger thank life screen fixed on the wall or slowly emerging from the ceiling, lights off, shades down, immersive surround sound on, and 4k projection emitting immaculate picture over your heads and across the room. It’s quite impressive… even thinking of it almost sends chills down the spine. But today, multifaceted families are demanding multifaceted environments. With advancements in technologies and a trend of people wanting to get a little more creative with their space, whether it’s 5,000 or 25,000 square foot home, we are seeing more and more people opt for multi-purpose entertainments versus dedicating valuable space to home theaters. Of course, we love this as well. Creating a multi-media entertainment space is almost like taking the concept of a home theater and bringing it out of a dedicated room, and then adding a few additional elements, to where families can now interact with one-another a little more, play games, eat, drink and be merry, all while watching the latest game, television series, or blockbuster. Of course this can all still be achieved within a home theater, but imagine doing all of these things while in the dark “Shhh… I’m watching a movie!” environment. Everything still comes into play within these new multi-purpose spaces, from the audio/video equipment coupled with the acoustics of the surrounding walls, to lighting, shade, and climate control, but something also has to be said for inner-weaving your home entertainment technologies into more of an open concept social space versus an enclosed one. This weekend we came across this great article by Cecilie Rohwedder via WSJ that pretty much nails it. 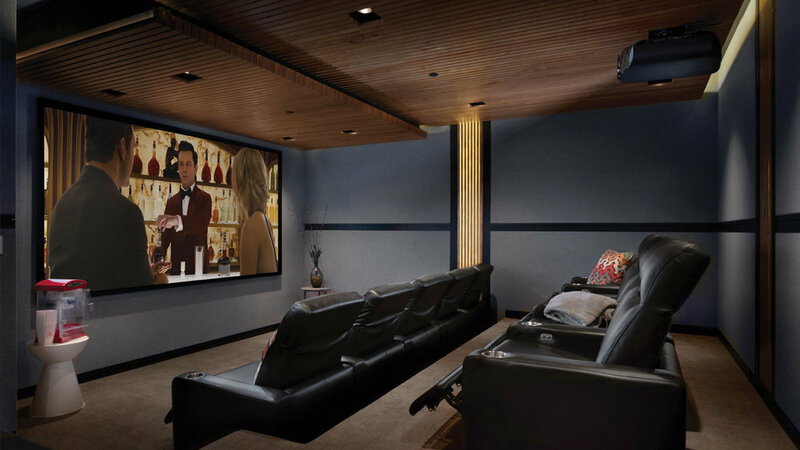 Homeowners are ditching their dark basement home theaters and adding multi-use media rooms equipped to host everything from movies to cocktail parties to homework. Today, home theaters are increasingly being replaced with multi-function media rooms—lounge-style spaces located in or near the main living areas. Here cozy couches, tables and chairs are arranged to facilitate TV and movie watching, as well as game night, cocktails, homework and hanging out. And all that A/V equipment? It’s nearly invisible. Fueling the shift is better technology. In the past, a big screen required a projector, which in turn required a dark room. Now, automated, light-blocking window shades and improvements in anti-glare, flat-screen TVs allow the rooms to be more versatile. Thin, high-definition screens hang on the wall like paintings and can disappear at the click of a button. Some have multiple TV screens for parallel broadcasts or social media, such as a live Twitter feed about an ongoing episode or electoral race. And there are plenty of outlets for electronics like laptops and videogame consoles. Home-technology companies are adapting to consumers’ growing taste for media rooms over traditional home theaters. The biggest challenge is providing theater-quality visuals and sound while keeping the equipment concealed. Custom installations of moving panels, motorized doors or lift mechanisms boost the price tag. Going forward, home-tech companies predict, media rooms will be even more gadget-free thanks to wireless technology and voice control. At a command such as, “Turn on ‘Game of Thrones,’ ” for instance, a previously invisible TV appears, window shades drop, lights dim and the score starts to play.